Technology solutions are helpful to a church only as they help expand ministry and enhance stewardship. We provide strategic and process consulting to enable you to implement the best technology, software and data analytics tools, at the right time, in the most effective way, to serve others well and to meet the ministry goals God has placed before you. Enable Ministry Partners’ Consulting goes beyond the day-to-day support and management of technology systems, to help you use those technology tools to support your vision and strategy. Because all the innovative tools in the world are useless if they don’t help you accomplish your ministry purpose. Our team has decades of church leadership experience in staff, lay leadership, and officer roles. We understand ministry people because we are ministry people. We combine that ministry focus with our experience in technology and business strategy to help you steward your resources more effectively and efficiently. We can help you identify ways in which your church management system can better serve you and how to go about realizing those improvements whether your challenges are based in training, configuration, or possibly, overall software fit. We also can supply “church software champions” who provide ongoing ChMS support as a service. Our church software champions combine deep knowledge of leading ChMS systems with the ability to apply the software’s capabilities to enable ministry by addressing your specific ministry and information needs. Our software evaluation process starts with gaining a clear understanding of your vision. 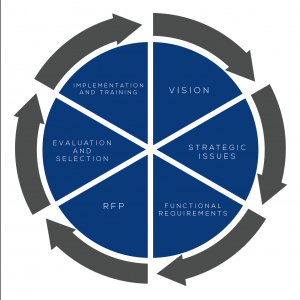 Through a combination of staff interviews, “whiteboarding” workshops and surveys, we will identify the strategic issues, bottlenecks or pain points of your current system and help you identify your individualized functional requirements. Functional requirements are more than a feature list. They are a profile of not only what your software needs to do, but how it needs to do it. Your software needs to be able to help you work in the way you need to work; you should not have to adapt your process to the dictates of the software design. Additionally, we will consider the technical requirements flowing from these functional requirements. We will address with you questions around security, the technical platform utilized, the need to accommodate mobile staff and volunteers, etc. From this initial requirements phase, we will create a Request for Proposal and guide your key team members through the vendor evaluation and selection process. Once you’ve decided on your best option, we will walk with you through the implementation and training steps as well. If your data could talk, what story would it tell? What decisions would you make differently if you were fully informed and understood the whole situation? How do your leaders spot the trends and opportunities that will help your church not only grow in numbers and giving, but will also enable you to serve and care more? Enable Ministry Partners’ Analytics and Decision Support services go well beyond stock reports to unlock the stories of your data and help you make better ministry decisions, serve your community better, and ultimately, reach more people with Christ’s Gospel. Our process brings together data from both internal and external sources including census and demographic data, church management software, and other internal sources. Our team can help you interpret and understand the data and use it in strategic and tactical planning as well as day-to-day operations. What are the drivers behind your giving trends? Assimilation- Who is attending, giving, serving and leading, and how do you stay on top of it? Front door and back door analysis- Who is coming and going, and why?